(P1) It finally happened. After months of teasing its first drone, GoPro today revealed the Karma. As we mentioned earlier, the quadcopter features a sleek and compact design, with foldable blades that’ll make it easy to fit into a backpack. 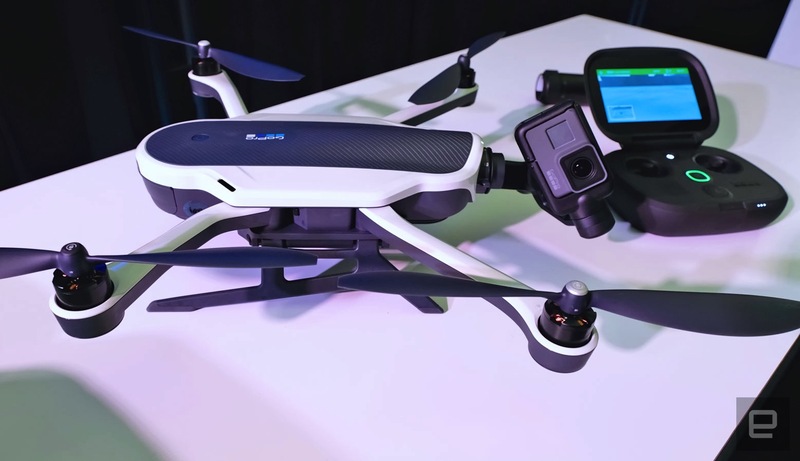 We had the chance to check it out in Squaw Valley, California, where GoPro hosted a launch event for the drone itself as well as the new Hero5 Black and Hero5 Session. The Karma is quite easy to fly, thanks to its gamepad-esque controller and an easy-to-use interface. (P2) GoPro says it didn’t want to complicate things, and that’s why the controller menus are simple and straight to the point. For example, you can set the Karma to go from point A to point B, for however long you want it to, with a couple of taps on the screen. There are also two main physical buttons on the remote, one to start and stop the drone and another to have it return to its original launch point. (P3) We only spent about ten minutes testing the Karma, but that was enough to deem it as an impressive device. Namely because of how easy it is to fly and pair with either the GoPro Hero5 Black or the smaller Session (Or Hero4 Black/Silver). Speaking of which, GoPro’s pricing the Karma at $799/£720 on its own, or $999 and $1,099 if you get it in a bundle with the Hero5 Session or Hero5 Black, respectively. It’ll hit in just a few weeks, on October 23rd. If you had a drone, what would you use it for? Do you think some day drones will deliver packages to people’s home? Why or why not? What are some ways drones are used by the military? What are the 3 design features GoPro boasts? When will the drone officially be available to purchase?